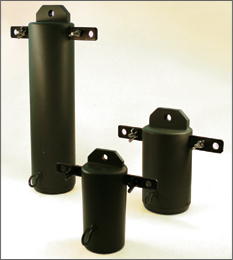 The TA series of transformers are rugged and lightweight, ideal for inclusion in transportable HF antenna systems. Combinations of power rating and impedance transformation ratio provide the antenna designer with a wide selection of units to complement most antenna configurations. The transformers are housed in extremely strong fibre glass bodies, hermetically sealed with low loss resin and suitable for any environment. The input coaxial connector is protected within the specially formed body and the transformer itself is grounded as an added protection against static and lightning induced EMF’s. A spigoted version, type TAS, is available for use with the Hilomast LLC range of masts. Configuration Fibre glass body Stainless Steel arms (chemically blackened).Low loss resin fill. Drab olive green or light sand epoxy paint finish.